The Peace Abbey and The Life Experience School gifted over 40 years of archival materials to the University of Massachusetts Boston in July of 2012. 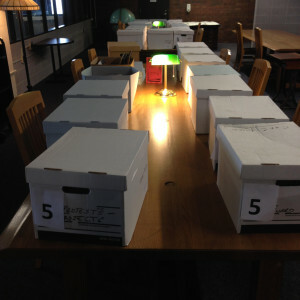 Twenty-six boxes of documents, photographs, CDs, videos, correspondence, newspaper articles, personal effects of notable pacifists and Courage of Conscience Award materials are available for peace and justice research and for public viewing at the Healey Library, University of Massachusetts Boston. Visit the Peacemakers Table, the protest model of the 9 foot Gandhi Statue and the busts of Oscar Romero, Samantha Smith, Gandhi and Emily the Cow at UMB. University Archives and Special Collections is open for onsite research Monday – Friday, 10:00 am to 4:00 pm. Please contact library.archives@umb.edu to schedule an appointment or to request reference assistance, and consult our online collections and Finding Aids at http://OpenArchives.umb.edu.